So my doctor gave me some new meds, and whenever I sit up, I get dizzy. So how better to treat this than lying in bed with a double-feature of intense, German WW2 dramas. It turns out, while this was not as riotous a night as watching “Clerks 2” and “Jay & Silent Bob Strike Back”, these films were both brilliant. 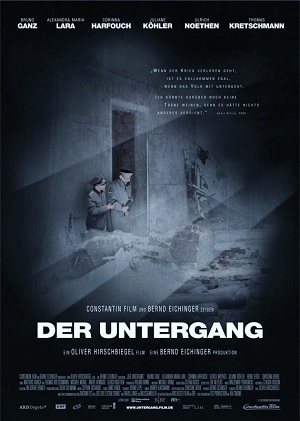 “Downfall” (Der Untergang) follows Adolf Hitler’s super-tense final days in his bunker. Berlin was under constant Allied bombardment, and Soviet troops were moving ever closer to the city. By this point, the typical documentary Hitler was gone. Bruno Ganz gives an amazing performance, showing Hitler with signs of Parkinson’s disease, occasional acts of kindness, and a rant-intensive, obsessive idea that Germany could still win the war. The story is based on a book by Traudl Junge, Hitler’s loyal personal secretary. Traudl stayed in Hitler’s bunker, because she felt a strange devotion to the man. She wasn’t a screaming harpy, spewing Nazi propaganda. Rather, she was a good secretary who happened to like her boss. That he happened to be a murderous tyrant was incidental. The film plays out both in the bunker, and outside on the rubble-strewn streets of Berlin. We see a ten-year-old boy who destroyed two tanks using a bazooka. He was in uniform, and he earned a medal from Hitler. There’s almost nothing left of Berlin, just packed underground shelters and Hitler’s bunker. There is a good deal of violence, and some horribly sad moments–deaths of characters we hate to see die. Most of all, there’s a sense of inevitability. Everyone knows the cause is hopeless. Hitler’s gone round the twist; he never understands that his troops are depleted, his squadrons sparse and surrounded. In a twisted way, “Downfall” shows Hitler in a human light. Yes, he’s evil and crazier than a shithouse rat, but his brain was fried by this point. When he and Eva Braun commit suicide, it’s a release for him, peace at the end of a long, crazy-evil journey. I almost felt sorry for the guy. One person worth feeling sorry for is Sophie Scholl. Her eponymous film, “Sophie Scholl: The Final Days” portrays the final days of a sane and kind person, sort of the anti-Hitler. Sophie and her brother, Hans, were members of an underground group trying to muster support to overthrow the Nazis. The group, calling themselves “The White Rose,” printed leaflets, and distributed them through the mail, and by leaving them on college campuses. During one brave mission, the Scholl siblings left thousands of leaflets around the University of Munich. When class let out, they were somehow singled-out in the crowd and arrested. This film would have failed without a brilliant Sophie to anchor the film. This film nailed it with actress Julia Jentsch. Her Sophie isn’t glamorous or beautiful. She plays her as sort of plain. Her role in “The White Rose” was more in the background, but when she was caught, after repeatedly denying participation, she confessed proudly that she was a conspirator. She implicated her brother, but nobody else. In the end, there was a ridiculous excuse for a People’s Court trial, where Sophie, her brother, and another White Rose member were convicted and sentenced to death. That sentence was carried out that very afternoon: as the guillotine falls, the screen goes to black. As the credits roll, we see photos of the real Sophie Scholl. Just from these static, 70-year-old snapshots, we can see how well Ms Jentsch captured Sophie’s looks. To me, the absolute strongest scenes were Sophie’s seemingly endless interrogation with Nazi investigator Robert Mohr (Alexander Held). In their early scenes, he’s simply looking for a confession. In subsequent questionings, it becomes clear that he’s grown to like the tough girl sitting in the hot seat. The day of her execution, he comes to see her one last time at the jail. No words are exchanged; none are necessary. Both actors are in top form in these scenes. If I had a complaint about this film, it would be that we don’t get an especially deep glimpse into The White Rose. That’s the group Sophie and Hans died for. Another five minutes in The White Rose’s headquarters would not have hurt the film at all. That’s a minor complaint, though. 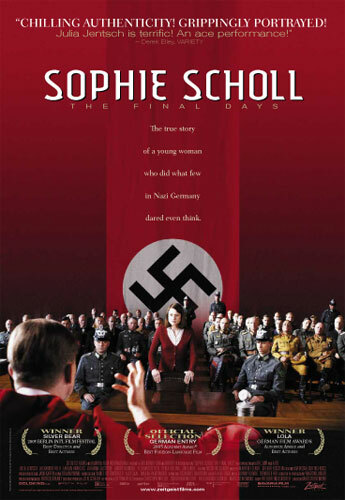 “Sophie Scholl: The Final Days” is brilliant, and well worth seeing. A couple of points about these two films. First and foremost, if you’re one of those people who hates reading subtitles? You’re screwed. There’s a lot of dialogue in both films, and it’s all auf Deutsch with English subtitles. Second, each of these films was nominated for the Best Foreign Film Oscar, though neither won. Finally, both lead actors–Bruno Ganz for “Downfall” and Julia Jentsch for “Sophie Scholl” won a ton of acting awards in Europe. They each deserve every piece of hardware they took home with them. This was an odd pairing of films for a night where I had vertigo, but I think a double-feature of “Inception” and “V for Vendetta” might have made my brain explode. Both of these films are tremendous, and I recommend them both heartily. “Downfall” is by far the heavier of the two; “Sophie Scholl” is serious, but its production represents Sophie’s unfailing optimism just as much as “Downfall” glows with Hitler’s end-game madness. Take a chance. Subtitles aren’t that bad. This entry was posted in Academy Award Nominees, Films, Foreign, Period Picture ("Costume Drama"). Bookmark the permalink.